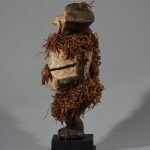 Ambete / Mbete figure, Zaïre (Dem. Rep. Congo / Gabon. 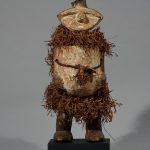 A fine and rare Ambete male figure standing on elongated, wedge-shaped feet with the thick bent legs, angular ankles and knees supporting the cylindrical torso with rounded hips, prominent pudendum and conical breasts. The head is helmet-like with abstract mask-like features including a square mouth, protruding nose and slit-like eyes framed by large oval ears as well as a domed geometric coiffure. 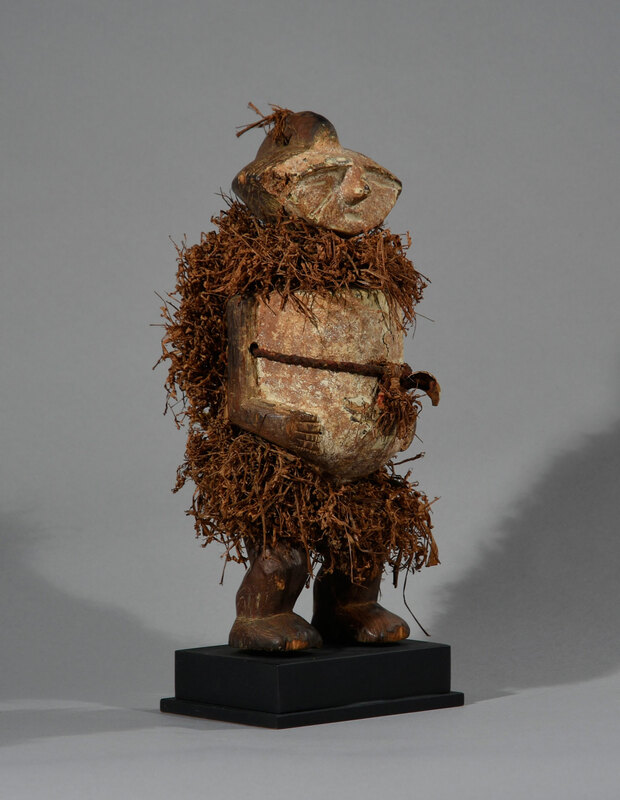 The figure has fine aged patina of kaolin with areas of black pigment at the feet, hands and head. 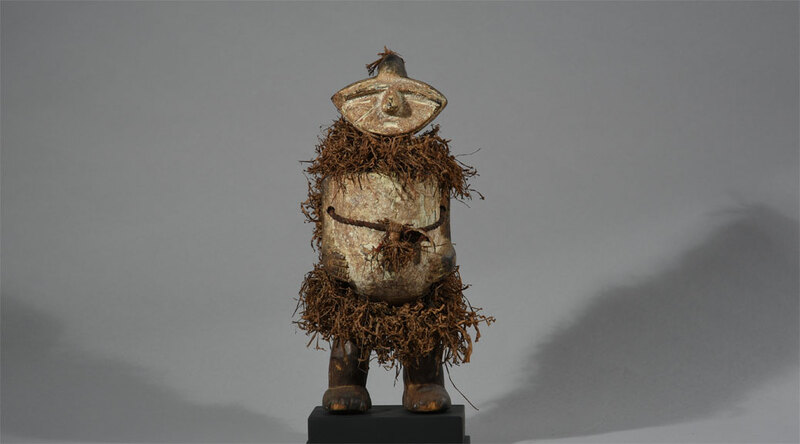 The Ambete sculptures are either heads, busts or full figures. 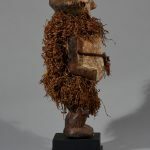 The latter are thought to have a connection with the ancestor’s cult – they were either used as reliquaries or placed alongside the ancestor’s bones in a basket. Therefore statues are often provided with a rectangular cavity, or the body itself may be in the shape of a reliquary chest. 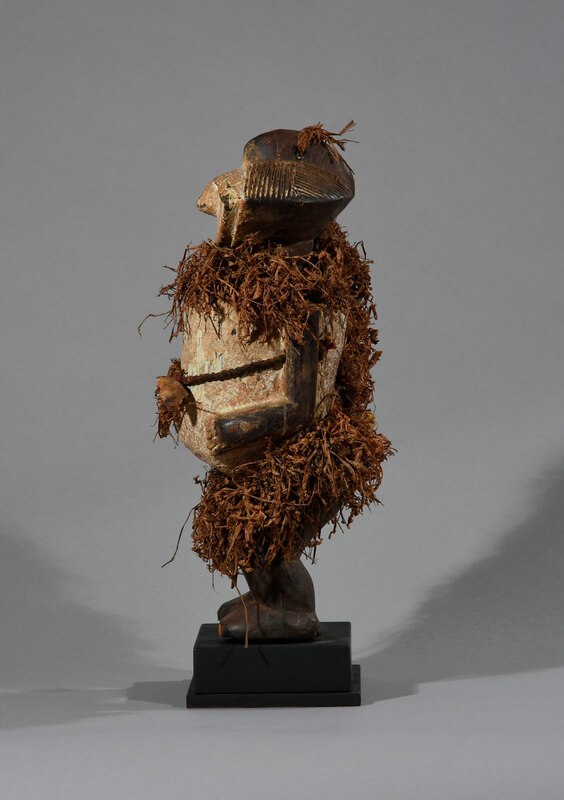 Heads and busts were probably positioned on poles and placed in front of the chief’s house. They may have had an apotropaic and emblematic purpose. 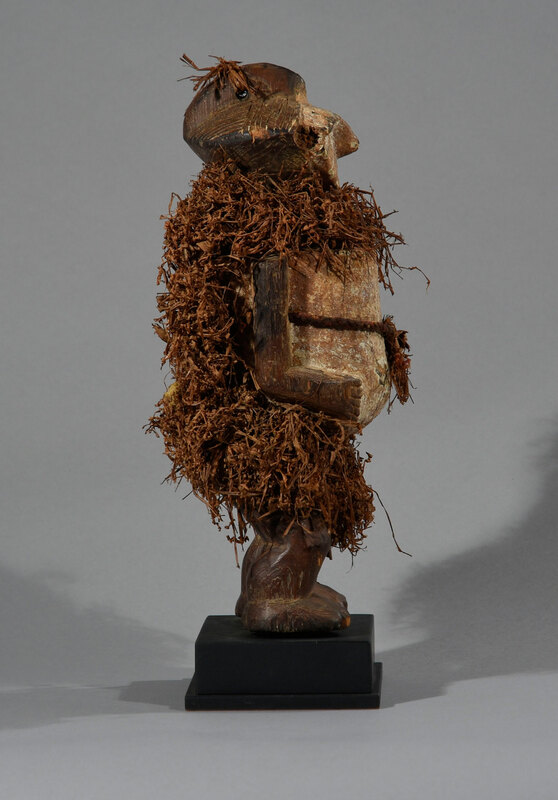 This figure’s head is sculpted in the round, the arms and lower extremities only roughly carved out. He is dressed in a suit made of plant fibers with a solid belt around his waist, which seems to have contained magical effects. The hole in the back may also have contained magical effects. 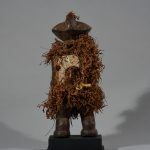 The Ambete (Mbete, Mbede, Mbete and Mbeti) figure originates from Kota in the Republic of Congo (near the northern frontier of Gabon) and in northern Gabon. In view of the shifting location of the peoples living in this region, it is impossible to trace the precise history of the Mbete culture, neverthe less certain ethnological and sociological aspects of their life are relatively well known, and we know that the secret societies were numerous and powerful. 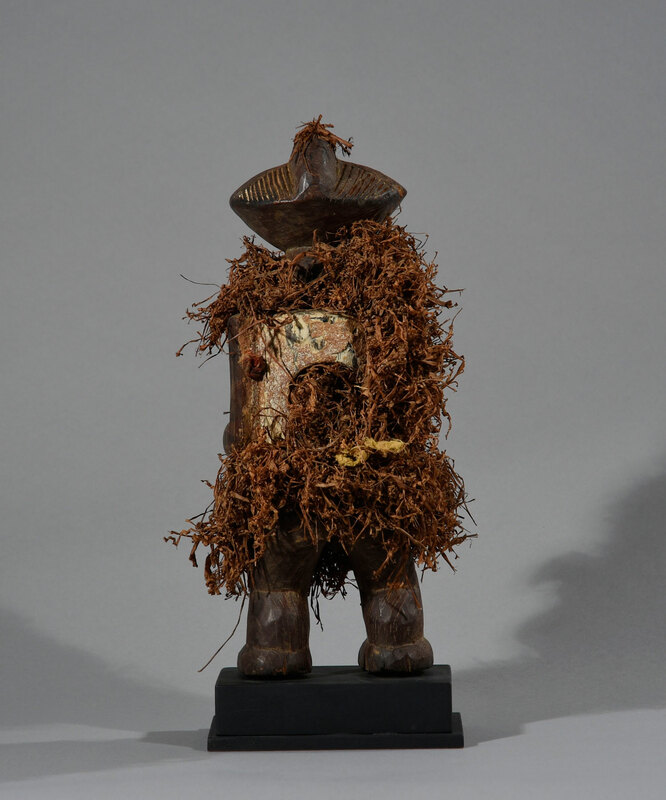 The Ambete do not have any centralized political organization; they practice ancestor worship. 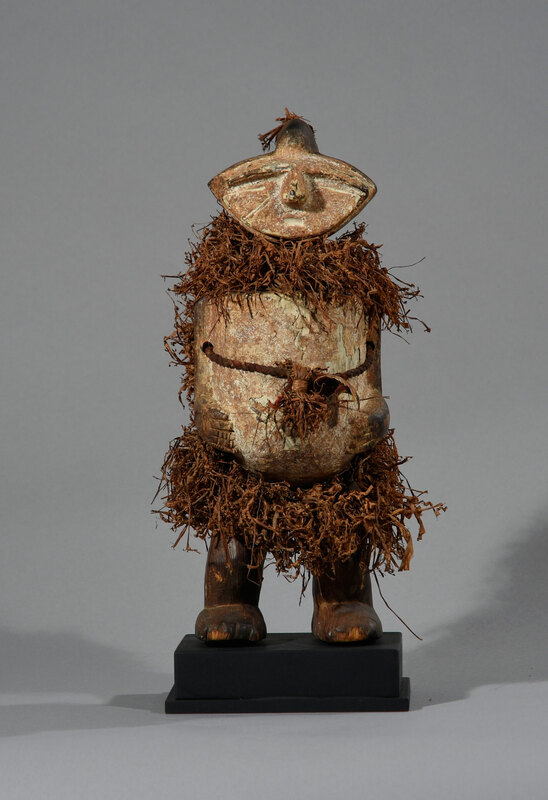 Ambete figures are rare, and little is known about their use or function. 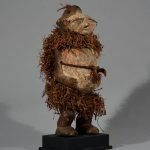 They are, however, often found in pairs and are thought to represent ancestors. Provenance: Bought at a gallery in Paris by a Danish painter, who lived in Paris in the 1960s.